Harvests in late spring/early summer season - stores into winter. Susanville is an excellent early season flavorful garlic from the mountains in Northern California. Susanville is an Artichoke that is rich in flavor and only moderately pungent. It is said to be from a virus-free test that took place in the 1980s and it can get quite large when grown in favorable conditions. It is a wonderful garlic and I highly recommend it for those who live in either warm or cold winter areas. It is well worth growing and is a fairly early maturing garlic which you can be enjoying while most of the others are still in the ground. 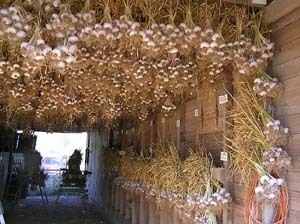 Susanville can get quite large when well grown and is best grown in conjunction with a long storing Porcelain or Silverskin for year around garlic. Sorry, sold out of Susanville for 2018.